From the glitz and glamour of Rodeo Drive to the excitement of Wilshire Boulevard, Beverly Hills is one of the most exclusive cities in the nation. This playground for the rich and famous attracts the world's elite, with countless dining establishments, an endless array of luxury boutiques, and several opulent hotels. The community has featured prominently in the collective pop culture for decades, thanks to its association with Hollywood and the wealth of Southern California. Together with Holmby Hills and Bel Air, Beverly Hills forms part of the Platinum Triangle. This affluent region is home to some of the largest estates in the area. Many residents are drawn to Beverly Hills for the countless retail boutiques and restaurants in the vicinity, as well as the prestige of the city's name. While today Beverly Hills has a reputation that evokes thoughts of affluence and extravagance, the city hasn't always been so glam. The first settlers arrived in the area in the 19th century, when it served as ranching grounds. Later, Beverly Hills would be used for growing lima beans. Oil exploration began in the 20th century, but when prospectors found the region lacking, they chose to sell off parcels of the property to various landowners. Since its humble beginnings, Beverly Hills has evolved into one of the most coveted ZIP codes in the United States. The city remains home to countless legions of celebrities, politicians, and businessmen. Beverly Hills also draws thousands of tourists each year, many of whom come to look for celebrities and enjoy some retail therapy. Beverly Hills also houses numerous spots of interest, including the Beverly Gardens Park and the Will Rogers Memorial Park. 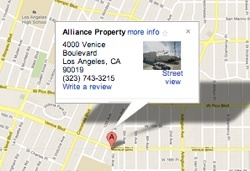 Are you a property owner in Beverly Hills? Alliance Property Management brings more than 40 years of experience to the management game, with a talented staff of retail professionals ready to address your business needs. From tenant screening to everyday maintenance requests, let Alliance Property Management tackle the responsibilities of your rental property.